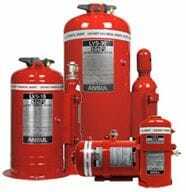 ANSUL vehicle fire suppression systems were invented and introduced in the 1960’s. 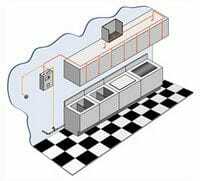 Since then, as mobile equipment has grown in size and complexity, so have our systems. Engineers and chemists have jointly developed a new generation of fire detection and suppression products including Triple IR Detection, Twin-Agent Suppressing/Cooling Technology. From small vehicles to large non-road equipment, you’ll find ANSUL systems protecting excavators, haul trucks, loaders, drag lines, dozers, drills, scrapers, graders, compactors, slag pot carriers, underground mining equipment, forestry, waste haulers, and agricultural vehicles. Under extreme conditions, uncontrolled fire remains among the greatest threats to life and assets. Containment must be immediate and total. The ANSUL Automatic Fire Suppression System (AFSS) provides fast, reliable fire protection for occupied and non-occupied areas in a wide range of vehicle platforms. Engineered for minimal weight, size and ease of integration, the ANSUL AFSS is centered on unique high-speed infrared optical detection and central alarm/control. Within milliseconds of a slow-growth or rapid-spread explosive event, fire is detected and contained with a field-proven agent, and activated either automatically or manually depending on the severity. Over the past four decades, the ANSUL brand has been built around the unique protection and compliance requirements for customers throughout the military and heavy industry. The ANSUL AFSS is no exception. The perfect product to complement the ANSUL line of vehicle fire suppression systems, LVS offers suppression and cooling together in one, instant step. It will take you into new markets, bringing more opportunity than ever before. With Class A and Class B fire protection backed by FM testing and approval, it's dependable quality you can trust. LVS — the smart choice.